I know it is Sunday, but I am already looking forward to Thursday. That market basket that my husband got me for Mother’s Day is quite something. It is like Christmas morning every Thursday night – as we unpack the beautiful wooden box with all sorts of goodies. This week’s basket came with this wonderful box of pistachio apricot granola. I can’t wait to put some on my yogurt in the morning. It’s the little things that get me through this end-of-the-year chaos. Since I was set for breakfast this week, I thought it was only fair if I made some treats for the girls. They do love granola – but I know they love scones even more. I have gone through many ways of saving recipes over the years. I started by keeping every single food magazine and marking the pages where I liked a recipe. That worked for a little while, but after I had over 20 magazines, I couldn’t remember what was in each issue. Then I started cutting out the indexes, and had a binder of them – with the highlighted recipes that I liked. Again, not very practical as I had to look through hundreds of pages to find what I was looking for. The next plan was to cut out the recipe and put it in a photo album, where I had dividers of the different types of recipes. After I filled up two binders, I was done with that method. At that point I decided I needed to use technology, and that’s when I started my blog. I tell you, I love being able to Bing a recipe from my blog and get to it instantly. Technology can be quite awesome. Instead of going to my usual stack for a scone recipe (knowing that I didn’t have any lingering around that I wanted to make), I went to one of the binders I created – and flipped to the “Breakfast” tab. I found this recipe that I probably cut out ages ago from either Gourmet or Bon Appetit and decided to see if it had stood the test of time. Boy did it ever – these scones were crunchy on the outside, soft and pillowy on the inside, with a touch of oat flavor, but nicely sweetened. I could have scarfed a couple of them down, except that I reminded myself they were for the girls – I already had my treat waiting. So, we will all be eating well this week, and we need to – if we are going to get through these last 5 weeks. Ugh! Stir together zest and buttermilk. Toss chocolate chips with oat mixture, then add buttermilk, stirring with a fork just until a dough forms. Turn dough out onto a lightly floured surface and gently knead 6 times. Is it me or are chocolate chips missing from the recipe? Sorry!! I substituted chocolate chips for the currants – I just fixed. Thanks for pointing that out!! I keep meaning to make scones, but always seem to forget about them. I’m sure once I do make them it will be hard to forget them! One of these days…Good luck with the end of the school year chaos. We’re in full swing here! 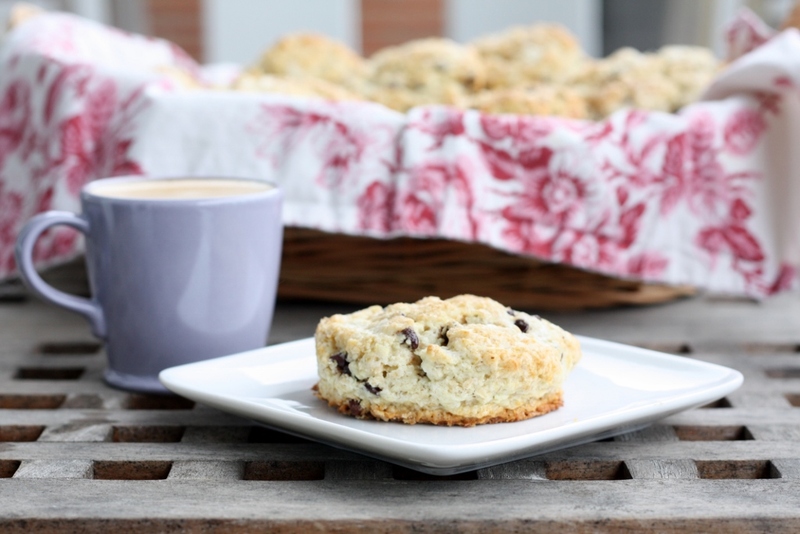 I love oatmeal chocolate chip anything – it sounds amazing in scones! Pinned! Sounds delicious and I love my scones warmed with a little hot tea on the side. Perfect for any time of the day really. Just pinned!